Just below the Main Lodge are the Annexes. 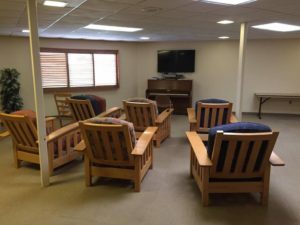 These facilities allow for smaller groups, i.e., small church groups, couples retreat or family reunions; to take advantage of the great amenities of the Main Lodge yet allow them some seclusion from other guests. 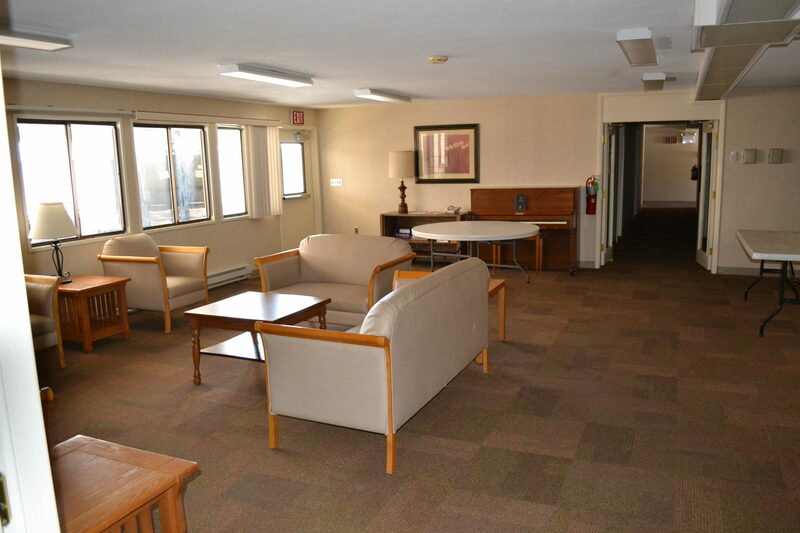 Each Annex features twelve guest rooms – four with two single beds, four with two full size bed, and four with one full size bed and two single beds. 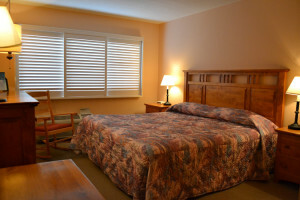 Every room features wall to wall carpeting, individually controlled heat and AC, electronic key card locks, and has a private bath with tub and shower, Plenty of parking is adjacent to each Annex. 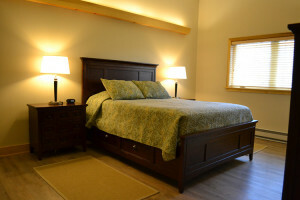 Harvey Lane Cottages are our newest accommodations. HLC are the perfect accommodations for the group looking for nicer housing than the traditional bunkhouse, but don’t want to pay the price for motel quality rooms. HLC offers several options. 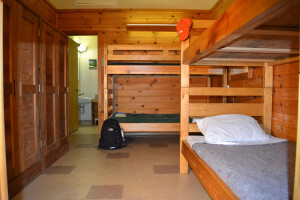 First there are “bunk” style rooms with either three or four beds per room. These are not your typical camp bunk, but are regular twin beds. 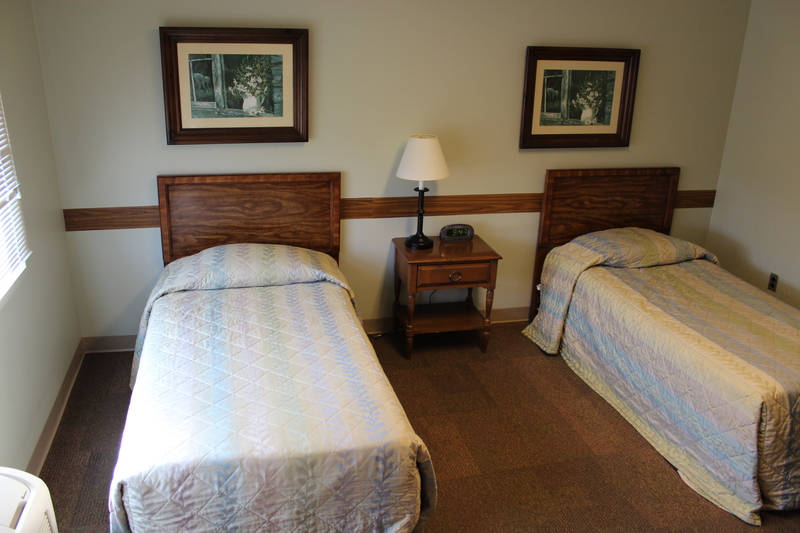 Each room has one set of bunks with either one or two additional beds on the floor. Each has its own handicapped accessible bathroom complete with shower, sink, and toilet. 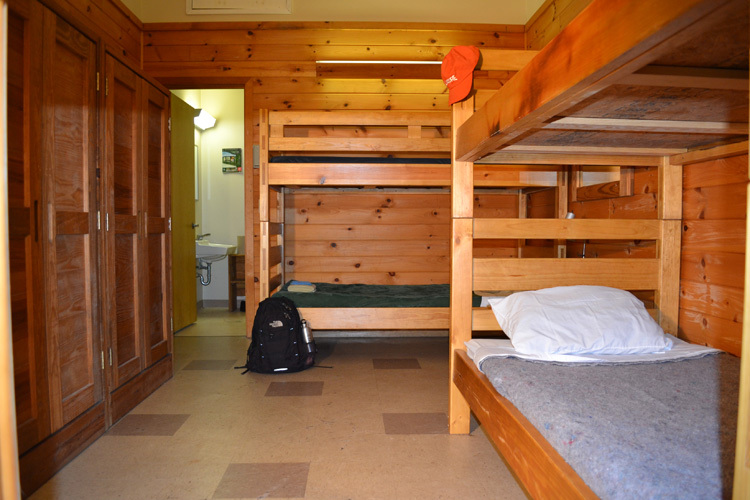 There are twelve bunk rooms with three beds and five rooms with four beds. HLC also has one queen room which serves very well for a married couple or speaker/leader that may need a little more privacy. 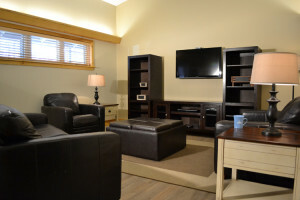 If you are looking for more upscale accommodations, Harvey Lane Cottages feature three apartments. Each apartment has two bedrooms (with the ability of sleeping up to nine individuals), living room, and a kitchenette. Apartments: Kitchen: small refrigerator, coffee pot, two burner stove, kitchen sink, dishes, and utensils. Bedrooms: complete with dressers, night stands, lamps and very comfortable beds. Living rooms: Leather sofa, love seat, chair, flat screen TV, and WiFi. 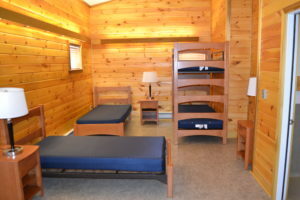 All village cabins have their own inside bathrooms, are winterized and heated and offer separate accommodations for chaperones. There are 4 villages at Ladore each offering sleeping accommodations for between 100 -144 people with an activity building centrally located in the village. When using a village you would be the only group in that village. Each village has a kitchen in their activity center which affords you the ability to handle the cooking for your group (if you desire to do so). Please know that it is a bare kitchen and you would need to bring your own pots, pans,utensils and paper products. Located on the north side of the property, A-Y-P Village can accommodate up to 144 retreat guests. 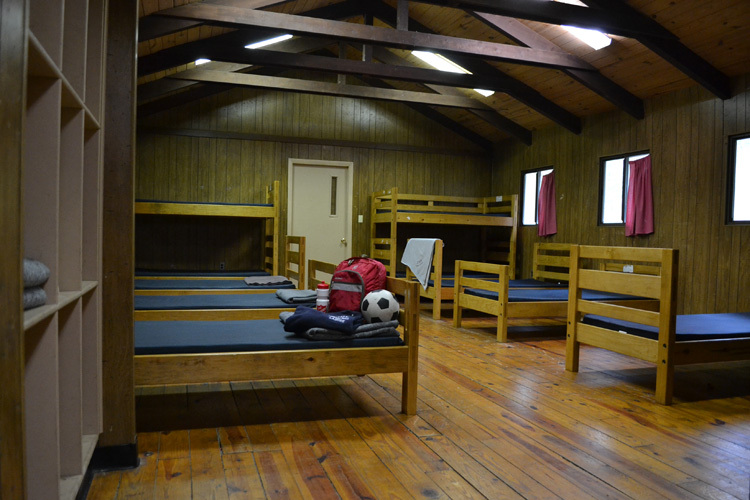 A-Y-P was built in the early 90’s, so while it is traditional camp housing, it exceeds your average bunkhouse. There are five buildings, each has two “camper” bays sleeping ten each. Each bay has its own bathroom featuring two showers, two toilets, and three sinks. Each building also offers one handicapped accessible shower and toilet. Located between these bays is a “counselor” room, perfect for chaperones to have access to, but privacy from, other members of their group. These “counselor” rooms have their own bathroom with sink, shower, and toilet and can accommodate up to four individuals. On the backside of three of these buildings there are extra rooms which can sleep four, each has its own bathroom facility. These rooms are perfect for retreat members who may need a more private space during your retreat or for group leaders who you may want to “spoil” by giving them their own room. A-Y-P Village is located near Mohawk athletic field and has an adjacent children’s playground. Small kitchen in the activity building complete with: oven, 4 burner flat top range, full-size refrigerator, microwave, and a sink. Seneca Village provides the best views of the lake among our five villages. 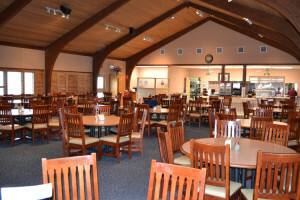 It is located on our south side just a short distance from our PARC Pavilion and our Carousel Dining Hall. Like Ai-Yuk-Pa, Seneca village is comprised of six buildings: five for housing and an activity building (seasonal.) Built in the late 1980’s Seneca bunkhouses are modern and comfortable. 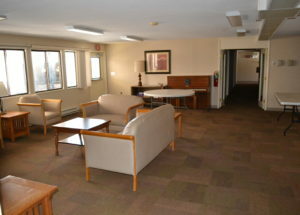 Each building consists of two camper bays and a counselor/chaperone room in the middle. Each bay can hold up to ten guests and has its own bathroom facilities. The middle room holds up to four with its own bathroom. 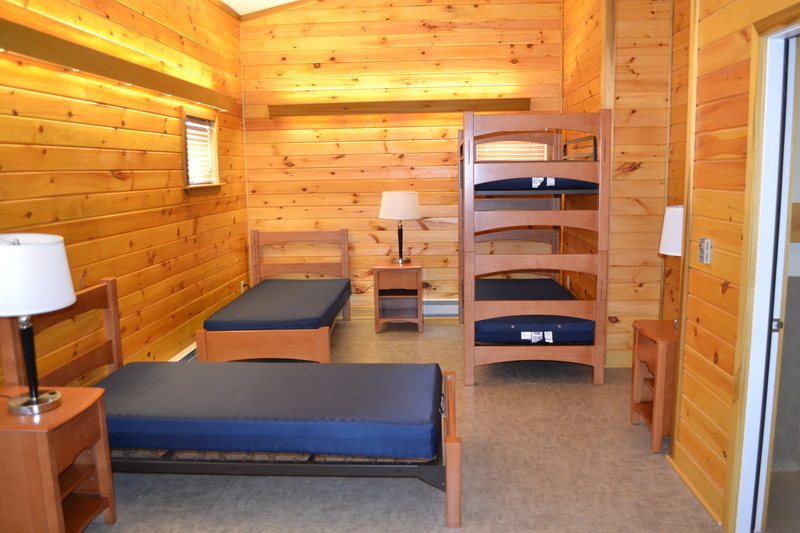 On the back of one of the bunkhouses there are two extra rooms for staff or special guests. These rooms each have four beds and their own bathrooms. Seneca can hold up to 128 guests. The village is built around a large field which may be utilized for multiple outside activities. Seneca is near a small playground and just a short walk brings you to the Oneida athletic field and rainy day pavilions. These villages were built in 1975, and are sisters in both structure and capacities. They are located on the north side of our property in close proximity to the lake, and share an athletic field featuring a new playground for our younger guests. The cabins are more rustic than our other villages, exuding warm feel with large exposed trusses and wood floors. 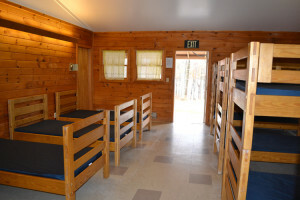 Each village features four cabins and an activity building. The cabins house ten guests on a side and share a community bathroom facility in the middle. There is a “counselor/chaperone” room located between the two bays of each cabin. This room sleeps four and has its own bathroom. Mohawk and Cayuga also feature an extra room with four beds and own bathroom. Mohawk is seasonal and only available mid-April – October. Small kitchen in the activity building complete with: oven, 4 burner electric range, full-size refrigerator, microwave, and a sink.